The Christmas Pickle is a tradition that takes place on the eve of Christmas. After returning from Christmas eve mass, the children are sent upstairs while the parents hide the pickle within the branches of the Christmas tree. The ornament in the shape and color of a normal pickle. After the pickle has been hidden in the tree, the children are then called downstairs to search for it. The first child to discover the pickle is then granted the first gift of Christmas. The Christmas pickle is believed to be a German Christmas tradition but has recently been proven to have originated in the United States sometime around the late nineteenth century. The tradition is for a specific child to win the first gift of Christmas. The gift is usually a smaller preemptive Christmas gift that can usually be shared between children (i.e. a coloring book, or family board game). The tradition was passed down from my Father’s side of the family and our family has participated in the tradition for at least the past twenty four years. My family has been involved with the tradition ever since my eldest brother’s birth and has evolved with our ages. When we were younger, the pickle was usually on the lower branches of the Christmas tree and was more easily located. As my brothers and I have gotten older, and since my family did not want to abandon the tradition, my parents have begun to hide the pickle more strategically to make the game more difficult to win. In recent years, the pickle has been found in the Christmas tree, in both indoor/outdoor wreaths, outdoor trees/bushes, and hidden within Christmas garland or within our Department 56 Christmas village. Additionally, the Christmas gift has evolved into more adult items that we would like, for example: a gift card, a DVD, etc. While typically this tradition is for children on Christmas morning, my informant’s family has changed this to a family tradition that helps the test people who are new to the family such as a potential spouse. The emphasis for this traction is on family ties and having a game that includes everyone, even the new comers. It’s an initiation ceremony. Every year at Christmas after his family has decorated the Christmas tree, my informants mother will hide a pickle shaped Christmas Ornament on the tree. The first of the children to find the ornament, and bring it to her, gets a special present from her. My informants mother (who is the active bearer in his family for this tradition) is German, however he is not sure where this tradition originated. 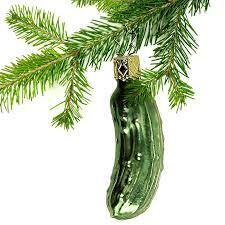 There are a number of possible explanations, including simply the fact that the green of the pickle ornament is hard to find amongst the green of a pine tree, and the fact that sending children on a search for a phallic object may be preparing them, at least on some level, for the sexual encounters they will have in the future. In any case, my informant just enjoys competing with his siblings for a chance at an extra present at Christmas time.